Bangui (Agenzia Fides) - There are contingents of the Blue Helmets of the UN Mission in Central Africa (MINUSCA) who do not do their duty to protect civilians. This is the accusation launched by the Central African Bishops at the end of their Plenary Assembly. "We pay tribute to those contingents of MINUSCA that ensure the protection of civilians", reads the message sent to Agenzia Fides. "However, we deplore the duplicity of some contingents that leave the situation deteriorate under their eyes, that take advantage of the situation, particularly the Moroccans in the east, the Pakistanis in Batangafo and the Mauritanians in Alindao. Such behavior only aggravates the already critical situation of the Country". The Bishops depict a dramatic picture of the conditions of the Country. "It is sad to note - they write - that beyond the capital and some cities, the State has a merely formal presence. Civil and military functions, even in areas where there are no armed groups, have no means to operate and their number is symbolic". Vast areas of Central Africa escape State control and are in the hands of armed groups who "repeatedly commit inhumane violence and serious human rights violations: rackets, arbitrary arrests, kidnapping, torture..." Rebel groups have come to the point of changing the demography of different locations (Kouango, Ippy, Bokolobo, Mbres, Botto, Batangafo, Alindao, Nzacko, Bakouma, Zémio, Mboki, Obo). 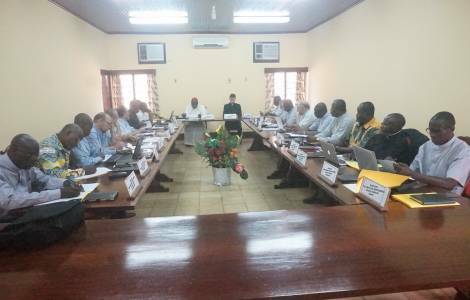 The Bishops are wondering why there is massive concentration of armed groups in the east of the Country and why the populations of some areas have been forced to sign a document stating that they refuse the presence of the Central African armed forces. To this is added the "porosity of borders to transhumance which increases instability in areas under the control of armed groups". The arrival of shepherds from across the border creates conflicts with farmers, while the porosity of the borders facilitates arms trafficking and the arrival of mercenaries, in particular from Chad, Sudan, Cameroon, Niger and Uganda. "We ask the governments of these countries to show humanity by helping the Central African Republic to emerge from anarchy for the good of all. In fact, a destabilized Country is an international problem", the Bishops say.